Home - Recommended Books - Could this be the best Ireland Travel Guide Book for first time visitors? Posted by: Liam in Recommended Books, Travel Tips Comments Off on Could this be the best Ireland Travel Guide Book for first time visitors? I received an email last week from Mark in Pennsylvania asking me what Ireland travel guide book he should pick up for his trip to Ireland later this year. He and a friend are heading over on their maiden trip and are hoping to cover as much of Ireland as possible in 2 weeks. They’ve been doing a little research here and there on various travel websites and blogs, but want to pick up a travel book for some professional advice. I asked Mark to leave it with me for a few days to give me time to check out a few books at the local bookstore. Here’s what I found. The way I see it, you could break this 500+ page book down into 3 major sections – Travel Tips, Places to Visit, and useful transportation advice. Each section is incredibly detailed, is all written from first hand experience, and is packed with information that will surely enhance anyone’s enjoyment of our beautiful little country. The book is littered throughout with tidbits of Irish history, touching on topics such as how life in Ireland has changed over time, Ireland’s political struggles, literary history and so much more. As you travel throughout Ireland, having some understanding of important parts of our history will add to your Irish experience. I was genuinely impressed by the array of travel tips in this book. So many aspects of travel advice are covered. Currency, international dialing, cellphone information, how to get cash in Ireland, emergency information, tipping advice, how to get back some of the tax you paid on items in Ireland, car rental need-to-know, personal safety tips, internet access info, and so much more! The book even has information about how to get your laundry done! Knowing a lot of this information ahead of time, or having easy access to it when needed, adds a level of comfort to your trip. Rick Steves’ Ireland definitely does favor the more traditional tourist spots in the country. Dublin, the southeast, Ireland’s beautiful western coastal areas, Kerry, Glendalough, megalithic Ireland, the small town of Kinsale, and more, all feature strongly. In fact the section on Dublin was over 80 pages! But that’s fine, right? After all, we’re talking here about first time visitors, or maybe people who are on their second or third visit to Ireland. Chances are, new visitors to the country do want to experience these parts of Ireland, and may not be ready yet to get off the beaten track. Rick & Pat (the other writer) definitely give you enough detail to have you well on your way to planning a wonderful vacation. Each town or city that is covered in the book come with recommendations for what to see, where to stay, good restaurants and more. For most, if not all, mentioned businesses, they have also included contact info and a price guide e.g. cost per night, food costs etc. This is great info to have ahead of time to help you budget and plan. Where possible you’ll also find details for tours you can take, things you can do for free (e.g. self guided tours), museums and more. There really is an incredible amount of information to learn from. The book also a couple of suggested travel itineraries including an hour-by-hour Dublin city itinerary, and a very handy suggested route to take on a 3 week self-driven vacation, which includes what to see and where to sleep. If you’re travelling Ireland by car (i.e. self-driven) then you’ll probably want to bring along a decent Irish road map, or a GPS device. The guide book does have an all-Ireland foldout color map included, and there are other maps throughout, but they’re probably not sufficient for navigating your way around the country. If renting a car, the car hire company will most likely have these available. Road maps are usually included at no cost, but double check with the company you choose. GPS devices will almost certainly hike up your rental price, so bring one if you have one that is equipped with an Irish road map. If you’re using public transport to get around, including trains, buses, planes etc., Rick Steves’ Ireland has the information you’ll need. A section containing general information regarding transportation is provided in the book, and sprinkled throughout, is information about how you can go from town to town via bus, rail, car etc. You’ll also find ferry and airport/airline info in the book. I’d definitely recommend putting some time into planning how you’re going to get around before you go. You’ll find it’ll make things that bit more familiar, and easier, when you get there. 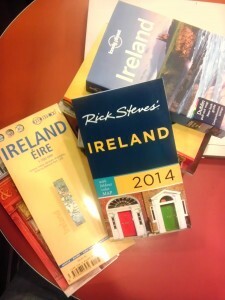 Information on sightseeing passes, Visa requirements, hotels vs B&B’s, An “Irish – Yankee” dictionary (ever hear of a Shebeen? ), a handy packing checklist, shopping/entertainment info, Irish nightlife, bike rental, city maps, a km by km self-guided driving tour of the Ring of Kerry, Northern Ireland information, driving tips, and more. The guide book is available in paperback cover format or you can pick it up for your electronic device in Kindle format . Thanks for reading! If you have a suggestion for another Ireland travel guide book, useful maps etc that people can take with them on their trip, please let me know using the comments below. Mark, is all ears, and so am I!